People who were born in the United States, though moved away as children, are often unaware that they are American citizens. This lack of knowledge is costing many people overseas thousands of dollars because of the Foreign Account Tax Compliance Act, which forces banks to reveal the identity, accounts and investment income of these Americans overseas. "[The] typical [client I'm] seeing now," reveals Virginia LaTorre Jeker, a tax attorney in Dubai, is "someone who [was] either born in the US and left as a young child or who has [an] American parent from whom they have acquired citizenship. The individual will always have another nationality, typically from a Middle Eastern country which they consider as their true home. Most times, these individuals will never have filed a US tax return since they were unaware they had any US tax obligations." Such a client might walk into her office and say something like this: "I went to my local bank... And they are asking me questions because they see in my Saudi passport that my place of birth was in the US. The bank is telling me I have to pay US tax and that they must report my accounts to the US government under a new law called FATCA." This, Jeker says, is how such persons find out they have a tax problem. Banks around the world have been voluntarily scrutinizing their customers in an effort to become compliant with the Foreign Account Tax Compliance Act (FATCA), a US tax law passed in 2010 as part of the larger Hiring Incentives to Restore Employment (HIRE) Act. Even though FATCA is a US tax law, it's changing the way banks in other countries are conducting their business. Under FATCA, a foreign bank or investment house or financial institution faces mandatory 30% withholding on their US-source income. Think about that for a second. A financial institution might have a portfolio of investments in the United States. FATCA says that 30% of their US-source interest, US-source dividends, 30% of stock sales, 30% of bonds that mature, 30% of US real estate that gets sold, all of that will be withheld as ​a tax before ever reaching the financial institution and its account holders. Foreign financial institutions can avoid this tax withholding if they agree to report to the IRS the identity, account information, and investment income for all customers who are "US persons." Accountholders who are Americans must also certify they are compliant with their US tax obligations or risk having their accounts closed. Banks are going through their customer list looking for signs of US citizenship. It's common for passports to indicate a person's place of birth. So a banker, seeing that it says on a person's passport that they were born in the United States, tells the customer they need to fill out a W-9 form, provide their Social Security number, and certify they are compliant with their US taxes. Oftentimes, Jeker says, "Once they go through the process [of] getting tax returns done, [they] owe no tax or very little tax," in the United States. Not only does the US tax its citizens on their worldwide income, but the US also requires its citizens to declare the existence of any accounts held by financial institutions outside the US. This foreign bank account report is due, each year, if a person has an aggregate balance of at least US$10,000 across all their non-US accounts at any time during the year. The foreign bank account report is information only. There is no tax or fee that's due when filing this report. But there are penalties for not filing this report on time. Civil penalties can reach up to $10,000 per violation. In the case of willful failure to file, civil penalties can reach the greater of $100,000 or 50% of the account balance at the time of the violation. Late filers can also be subject to criminal penalties. One of the peculiarities of the FBAR is that the US government is only looking at the total account balance – including accounts held jointly with other people and accounts where the person doesn't have ownership of the money but does have signature authority over the account. "Families in the Middle East tend to commingle funds a lot," Jeker says. Common situations: "Son who has US citizenship but has been living in the Middle East all his life has been named on [a] joint account with [his] father. The bulk of the funds, if not all of them, will belong to the father, who is a non-US person. Or in some cases, the oldest son's name will be put on everything, but the assets and income are not really his until his parents pass away. This can cause a lot of problems from a US tax perspective since the financial institution will be reporting the accounts under FATCA but the US 'nominee' has not been filing any tax returns, FBARs or other information returns for foreign financial assets." In such cases, the highest account balance at any time during the year is reported to the US Treasury Department on the foreign bank account report. "The best position is to disclose to IRS even though it's not your money, while clearly indicating that you are holding as a nominee. The family members may get upset about such disclosure because the money or assets are not beneficially owned by the US family member whose name may be on the accounts," Jeker says. And how do clients feel about this? "They are very concerned the IRS will think they are hiding this money, even though they are not." "It's sad," Jeker adds, "but I'm advising my clients to stop these arrangements with a US family member. [We are] rearranging family relationships because of this." It's a prime example of the "tail wagging the dog." Where is this going to go? "I don't know," she replies, "clients have no choice. The choice is: either comply. Or change your way of doing things. Or you get out of the system. And take your whole family with you." "Once the panic subsides," she adds that the focus shifts into "how to give up citizenship in order not to be a 'covered expatriate.'" 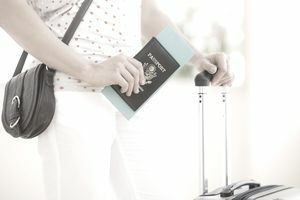 In the year that a person renounces his or her US citizenship, the person is subject to the regular income tax on their worldwide income plus an "exit tax" on the unrealized gains of real estate, investments, and other property. It's getting "tougher and tougher to get out" of the US tax system, says Jeker. And not for just citizens, but green card holders as well. The fees for renouncing citizenship have increased. An expatriate pays a fee of $2,350 to the consulate or embassy to process a renunciation; the fee was $450 before September 12, 2014. This fee is in addition to any taxes paid through the IRS. Request a Social Security number. File US tax returns reporting worldwide income for the past 5 years. File US foreign bank account reports for the past 6 years. Pay any tax and penalties. Schedule an appointment at an embassy or consulate to renounce citizenship and pay a $2,350 processing fee. File a final tax return in the US and pay a special tax for giving up citizenship, called the exit tax. How do people feel after learning about what their options are? "I may owe tax to the IRS under the law, and I am willing to pay taxes due. However, I don't deserve to have penalties since I was unaware of my tax obligations and filing requirements. How should I understand such rules when I have been living in the Middle East all my life?," is a common sentiment expressed by clients, Jeker says. How does the IRS view the situation? Jeker told the story of one person. "He was an accidental American, who was unexpectedly born in the US while his parents were on vacation there. He didn't fully realize he was a US citizen, nor did he know about tax and reporting obligations of the US." IRS agents had the "mentality we didn't believe him." "That's scary to me. I'm dealing with these people all the time. Enforcers don't have a realistic view of what's in the trenches," she says, mentioning that the IRS takes way too long to wrap up its processing of the paperwork. Jeker even has one client whose case has been going on for four years and it's still not resolved. Accidental Americans can run into problems with their home country, too. It's illegal in Saudi Arabia, for example, for a Saudi to have dual citizenship. Theoretically, it's possible for the Saudi government to strip the person of his Saudi citizenship and send him into exile. The information that the US government collects under FATCA will be shared with other countries starting in 2015. "No one really knows what the Saudi position will be," Jeker says. "The grab is everywhere. There's no privacy anywhere. It's a very serious situation for a lot" of people. The information contained in this article was provided by Virginia La Torre Jeker, J.D., who is a US tax specialist based in Dubai, UAE, with over 30 years of experience. She is an attorney admitted to practice in New York State as well as admitted to the US Tax Court. You can learn more about Virginia at http://blogs.angloinfo.com/us-tax/about/. You can email her at vjeker@eim.ae.